Kew is privileged to some of the most attractive leafy, tree-lined streets in Melbourne, making professional gutter cleaning in Kew essential. All those beautiful trees can result in a build-up of foliage and grime on your roof, which can lead to a series of issues when left untreated. This is especially important when autumn turns into winter, with the combination of heavy wind and rain creating a recipe for disaster for any clogged gutters. When debris gets blocked in your gutters, waterflow is restricted and it eventually builds up and overflows. The water can spill out, resulting in leaks to your roof, living spaces and water damage to your basement, ultimately harming the foundations of your home. It can also hinder your landscaping efforts and create the perfect breeding ground for a series of harmful bacteria, insects and rodents. Hiring the professional gutter cleaners at LeafVac takes care of all these problems for you. Our family owned business uses state-of-the-art technology to clean gutters as fast and unobtrusively as possible, using low-noise machinery to complete the job with no mess and no hassle. We guarantee work that’s respectful of your privacy and property and ensure all staff are fully trained, qualified and insured to complete the job safely and effectively. 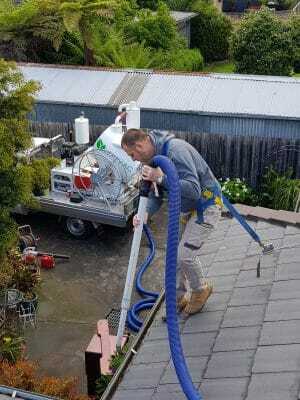 Contact LeafVac on 0455 488 837 to book your professional gutter cleaning in Kew today.